Recently, I was contacted by my friend Jeff Fowler, who is a dedicated member of All Saints Episcopal Church. Jeff and I have known each other for several years, often crossing paths in our various volunteer activities. He kindly invited me to his church where I was inspired to write this latest rendition in my running series on Parma’s wonderful places of worship. Upon entering the church, I met Reverend Canon Nancy Wittig. As we began to talk, I became fascinated by her amazing story. In fact, afterward I “Googled” her and found that we have one of America’s heroes of women’s rights in our midst. Rev. Wittig has only been in Parma since October and is the interim Pastor of All Saints until the parish selects a new leader to take the place of Pastor Heather Hill who was reassigned to a parish in Hawaii. The Reverend has three children and seven grandchildren whom she adores. Like many of Parma’s churches, All Saints was born in Cleveland. In fact, the parish began in the Scranton-West 25th area before moving to Parma in 1950. According to oral history, their first services were held in that year “in the Recreation Hall of the City of Parma” and, later “in Parma Junior High School (Ridge and Ridgewood).” Then, in 1952, the congregation raised $10,000 to purchase their current property on Ridgewood at Ames. Groundbreaking for the current church took place in 1953. All Saints is dedicated to serving the greater Parma community. In fact, they are very proud of their mobile food pantry, which takes place every third Saturday of each month from 9:00 until 11:00 am. Commencing in 2014, this partnership with the Cleveland Food Bank will celebrate the 500,000th pound of food donations to the needy this month. This little parish proves that a small number of faithful, loving people with big hearts can accomplish incredible things. The parish also rents out its hall, which can host 80 to 100. Sunday services are held at 8:30 and 10:30 am, with Sunday school at 9:45. In closing, I want to thank Rev. Canon Wittig, Jeff Fowler and Ray Heitland for taking the time to enlighten me about their parish and faith. 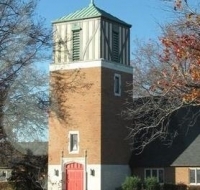 If you would like to find out more about All Saints Episcopal (8911 West Ridgewood Drive) visit them online at www.allsaintsparma.org, email them at office.allsaints@ohiocoxmail.com, or call 440-888-4055. Best wishes for a healthy and warm spring!